...is basically the best diet for fracture healing; yet, few doctors seem to be serious about the importance of diet. 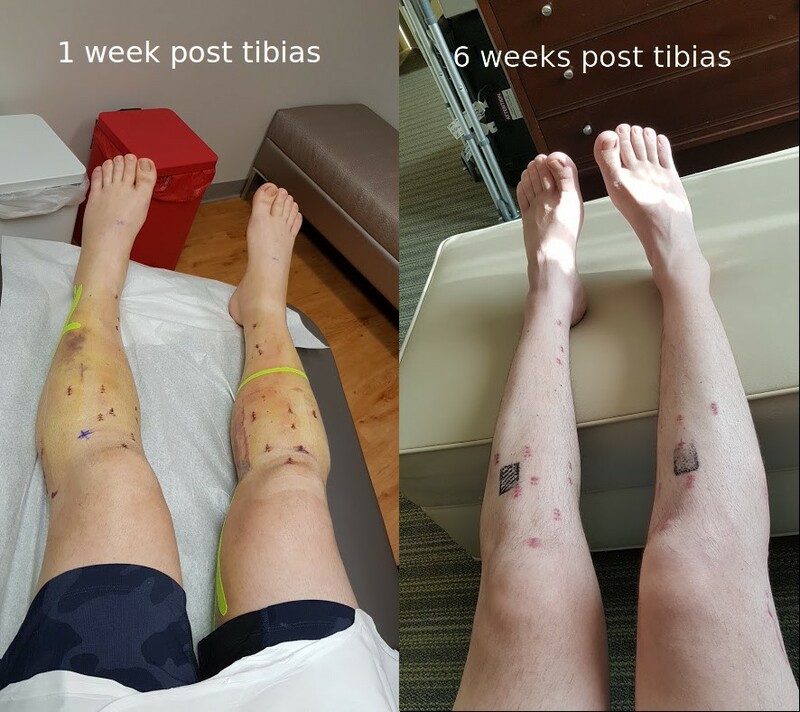 Folks who maintained their regular diet have lost large amounts of weight (40lbs, or so much that their legs looked "like twigs") post-surgery, and most of that weight loss was muscle. You probably don't want that. The most important aspects of a good post-op diet are calories, protein and supplements. The body has increased metabolic demands as it tries to heal the fractures and build bone. It appears that you need 2000 extra calories per segment break. That means 4000 extra calories for any bilateral lengthening, and 8000 for quadrilateral lengthening! If you aren't used to eating a lot, stuffing yourself with sufficient food to meet these demands will be a challenge. Worse, a common side effect of painkillers is reduced appetite. However, even after getting off painkillers (except for one per day before PT), my appetite has plummeted. I should eat over 5000 calories a day: 1600 (my BMR) + 2000 * 2. As of 3 weeks post-op (tibias), I've barely managed to hit ~3000 calories a day, despite being lucky to have my girlfriend cook yummy dishes for us every day. My thighs look visibly slimmer - the muscles have been atrophying due to drastically reduced activity. My belly is a little larger, so I'm not sure how effective it would be to actually over-eat 5000+ calories per day, for muscles that you can barely use, let alone stress or train with significant weights. At 3 weeks after femurs, my glutes have also atrophied a lot, which causes pain when sitting. Anyway, if you eat 4000 extra calories a day, a decent portion of that will contain protein. Beware that increased protein intake will stress your kidneys, and if you don't increase your water intake accordingly, you may end up with increased blood urea nitrogen levels, which is dangerous. Use a transparent graded bottle and make it a goal to drink 2 (or 3, 4, ...) bottles every day. It's easier to keep count by using a larger bottle.I have a 1500mL bottle and I make sure to drink two/day, completely. Time it during the day. Waking up at night because of a full bladder will disrupt your sleep. The Paley team prescribed me 10,000 IUs of Vitamin D per day. Dr. Robbins also recommended a calcium and multivitamin supplement called Silical System Plus Silical Boost. I've been taking collagen (for soft tissue growth). On Day 20, my range of motion was measured at 14 (104) degrees for ankle dorsiflexion, and 140 degrees for knee bending, which were surprisingly good numbers to the PT (Jeff). I'm not particularly flexible, and I've only done minimal yoga pre-op, so maybe the collagen supplementation helped. Or I was that flexible to begin with...who knows. But taking collagen as insurance shouldn't hurt. I've also been taking curcumin (anti-inflammatory). My scars have been healing quite well.